It’s a clever online platform that lets you project your life through a ‘lens’ Check out my first lens: a snapshot of my project management experience on Rock Chic. The media loves to tell us what to do. We absorb advice and values from TV doctors, faceless web commentators, celebrity Tweeters, and the front page of the daily papers almost without thinking about it. We are so used to this that we routinely mistake hectoring for empowerment. When faces on the TV tell us how we should dress, what we should feed our children, what kind of car to drive, and where to go on holiday, we accept the underlying message that: you’re not smart enough to figure this out on your own. The expert bullying has been around for a while. Back in 1965 Mick Jagger snarled about a man on the TV telling him how white his shirts could be and the barrage of advice has grown faster and more furious since. 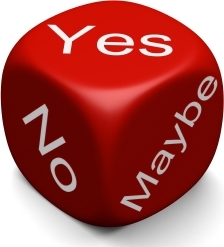 When in doubt, saying “no” is often more important, and more definite, than saying yes. Sixteenth-century essayist Michel de Montaigne wrote: “There are a thousand ways of hitting the bull’s eye, only one of hitting it.” If we entertain all possibilities it becomes almost impossible to hone in on what it is we want. Philosophically, this raises the question of whether it is better to be in a perpetual state of anticipation, or whether we prefer simple fulfilment. This is a matter of education, preference and, to a large extent, personality. Whatever one’s tolerance for uncertainty and imprecision, we all have to make decisions. In order to make decisions that are right for us, and not made out of a sense of social duty, we need to have clear priorities. We need an ordering scheme – call it morals, values, goals, or a life plan – but we need something meaningful to inform our choices. JD Salinger’s precocious creation Seymour Glass suggested that: “Every man, woman, and child over the age, let us say, of twenty-one or thirty, at the very outside, should never do anything extremely important or crucial in their life without first consulting a list of persons in the world, living or dead, whom he loves.” It is a mild prescription, hardly the antidote to a lifetime of advice-taking, but it is subversive in a small, gentle way. Replacing the anonymous buzz of cultural imperative with the specific voices of people who do know us and care about our happiness is a baby-step towards autonomy. A step that, once taken, puts us on a path not in relation to a particular decision, but towards a way of being that has the potential to transform our decision-making process and, by extension, our lives.